Hari Seldon is a fictional character in Isaac Asimov’s Foundation series who studied broad patterns of human behavior, and through that study was able to predict the collapse of civilization. The general principle is simple: large masses of humans are similar to large masses of atoms in a gas. Predicting the behavior of any individual atom is nearly impossible, but the prediction of the behavior of a gas–how it will react to changes in temperature and pressure, for example–is simple and deterministic. You don’t need to know how each individual atom will behave, because in the aggregate masses of atoms show statistical properties that are invariant. Isaac Asimov’s premise in the Foundation books is that large masses of people are predictable for the same reason: the large-scale flow of action is driven by statistical factors that will cause predictable patterns to emerge, even if the behaviors of individuals cannot. So call me Hari Seldon… because I’ve been looking at some patterns recently, and I’m convinced Western Civilization will completely collapse within the next 200 years. Yes, I’m aware that there are plenty of right-wing wackos who talk about “the collapse of Western civilization” based on their fear of homosexuality, feminism, inter-racial marriage, or whatever other phobias they have. My argument has nothing to do with that. As I will get into below, previous historical collapses have all been “systems collapses” that cannot be traced to single causes, and any attempts to do so are both stupid and misguided. Yes, I’m aware of ideas like “chaos theory” and the “butterfly effect” which suggest that small changes in individual actions can have enormous effects on larger systems, in which case the premise underlying Hari Seldon’s predictive abilities in the Foundation series would be invalid. However, whether a large-scale system exhibits “sensitive dependence” (the technical term for systems that may be subject to the “butterfly effect”) depends on the details of its dynamics, such as whether the feedback loops present in the system tend to be more amplifying or self-correcting. We simply do not know the mechanics of human cultural interactions well enough to know whether human civilizations, writ large, fall into the category of “convergent and self-correcting” or “divergent and chaotic”. If they are convergent and self-correcting, then at least the general premise of Hari Seldon’s predictive abilities in the Foundation series is entirely reasonable. Yes, I actually do think it’s possible to measure (or at least evaluate in an ordinal way) different levels of complexity in culture. I will describe briefly below what sorts of indices I’m using to infer “more complex” and “less complex” culture, but I will not get into a detailed defense of the question “is it really possible to compare any culture to any other culture?” I’m willing to get into that in the comments if you absolutely feel the need. I mean, if you really can’t live with out it. No, I’m not saying that more complex cultures are “better”; I’m not even necessarily saying that the collapse of our current cultural system would be a bad thing. I’m just talking about patterns in history. One thing we’ve seen in the past is that total collapses always lead to new things. If you are inclined to see this prediction as a good thing, in a “phoenix from the flames” kind of way, I certainly won’t argue against that. Yes, I’m kidding about all of this. Or at least, I’m only semi-serious. I’ll let you read through the rest of this article and decide how serious you think I am. With that out of the way, we are ready to begin. Let’s start by looking at the Bronze Age Collapse, labelled in red in the above graph. This period of time has been studied extensively, but if you want a good synthesis and summary I would recommend the book 1177 B.C. : The Year Civilization Collapsed by Eric H. Cline. The specific date in the title is somewhat arbitrary, as the author willingly admits, because the decline took place over a span of around a hundred years. Different experts mark the start and end points slightly differently, but to make things simple we can say: civilization in the Mediterranean and Middle Eastern region in the year 1200 B.C.E. was completely different from that found in the same region in 1000 B.C.E. In 1200 B.C.E., civilization was a highly complex interlocking network political and trade relationships among the Egyptian, Assyrian, Babylonian, Mycenaean, Mitanni, and Ugarit empires. Enormous trading ships, with culturally diverse passengers and cargo were used to exchange precious metals, artwork, clothing, food and spices to people in these different regions. The kings and queens of the different empires engaged in regular communication via stone tablets, negotiating alliances and political policy and updating each other on the news in their domains. Literacy among the upper classes was high, and people who survived early childhood often lived as long as people do today. Gigantic palaces were built, wealthy merchants complained when their shipment of gold did not seem pure enough upon arrival. By any standard of “complexity” of a civilization — the distance of trade routes, the sheer physical scale of art and architecture, the networks of interlocking political alliances and dependencies — the “Western World” was experiencing a golden age. Two hundred years later, by 1000 B.C.E., that part of the world was populated by huddled clusters of poor cities that engaged in almost no trade, and artwork, architecture and literacy shrank to almost nothing. You can even do a quick glance over Wikipedia to get a feel for this pivotal point in time: the entry on Babylonia describes 1026 – 911 B.C.E. as a “period of chaos“; the years of the Hittite Empire are given as 1600 B.C.E. to 1178 B.C.E. ; the years of Mycenaean Greece are given as 1600 B.C.E. to 1100 B.C.E. ; the list goes on and on. Professor of Archaeology Colin Renfrew has noted that when civilizations undergo a complete system failure, they always exhibit four general symptoms: 1) the collapse of a global or central administrative system, 2) the disappearance of the traditional elite class, 3) the collapse of the system of economy, and 4) settlement shifts and population declines. All of these things happened, dramatically, in a span of two generations starting around 1200 B.C.E. When we look at the evolution of civilization prior to the collapse (looking to the left of that first red arrow on our graph above), the world was not all peace and prosperity. Empires rose and fell, and there were disasters and famine and all sorts of cultural changes. But going all the way back to a pivotal point in the evolution of Western culture that you probably have heard of, the development of Hammurabi’s Code by King Hammurabi around 1800 B.C.E., there had not been such a massive reorganization of the cultural system in such a short period of time. Hammurabi’s kingdom didn’t outlast his death in 1750 B.C.E., but Babylonian culture endured. Even when the Hittites came in and sacked the city, and the Kassites came in and effectively took over Babylonia, they embraced many aspects of the original Babylonian culture and political system. The changes made by these transitions of power were evolutionary, not catastrophic. Over time, the collection of regional empires in the area developed into tightly interdependent political and economic mesh that grew both in geographic span and in the number of interdependent parts. Although historians have identified a number of contributing factors that likely destabilized the system toward the end, none of them can be given credit as the cause of the collapse. To date, the most coherent explanation is that there is no single cause, but that rather it was a total system failure: like a game of Jenga that has gone on too long, the system had grown to the point where there were simply no viable moves left to make. It took about 700 years to get from Hammurabi’s innovative Babylonian legal code to total collapse of the region. It would be another 900 years or so before the world saw the first stages of what would be the next great peak of civilization: the Roman Empire. Between 400 B.C.E. and 200 B.C.E. the Roman Republic is starting to achieve amazing innovations in technology and architecture: they have flowing water in their cities, they are developing a standardized system of roads, and they develop concrete and the well-known “Roman arches.” They even begin binding pages together into hide-bound books. Then for the next 700 years or so that followed, their political and economic structure grows in size and complexity. Their military both enforced peace for hundreds of years, and enables expansive trade routes from Hispania to Babylonia, and from Armenia to Aegyptus. But as if some kind of cosmic pendulum had reached the apogee of its swing, things started to crumble: wars, raids, and economic troubles that started around 400 C.E. would spiral out of control. In 476 C.E. Romulus, the last of the Roman emperors in the west, was overthrown by the Germanic leader Odoacer. And over the course of a few hundred years, the entire infrastructure of the Roman empire collapsed: literacy, trade, architecture, and international science and law shrank to almost nothing in the West. Measured from the start of the Bronze Age collapse (~1200 B.C.E.) 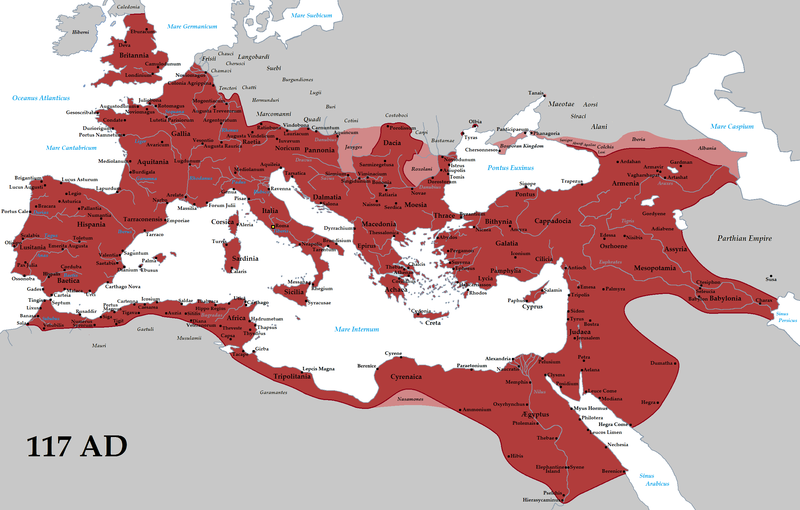 to the start of the Roman Collapse (~400 C.E. ), our cycle is about 1600 years. We can also measure from beginning points, although these are always more subjective and arbitrary. Maybe we can use some pivotal cultural development to mark the beginning of an accelerating growth in the size, complexity, and political and economic interconnectedness of civilization. The approximate time from Hammirabi’s Code (~1800 B.C.E.) to the Roman roads and aqueducts (~200 B.C.E.) is also about 1600 years. Can we look to the next cycle? If it follows the same pattern as previous cycles, we have about 700 years from “pivotal cultural development” to “total cultural collapse”. The next big systemic failure of Western Civilization should therefore take place over the course of the next 200 years. Western Civilization collapsed over the period from 1200 B.C.E. to 1000 B.C.E. It did it again from 400 C.E. to 600 C.E. The next phase should be, if the pattern continues, from 2000 C.E. to 2200 C.E. I find this very reassuring, in a somewhat nihilistic way. If we take this seriously (and for the record, I’m not saying we necessarily should), it means that the crises we see exploding around us couldn’t have been avoided. It means there are no glorious “what ifs”, no anxiety of responsibility: there is no alternative history where if (for example) Trump had not been elected, we could have seen a new Golden Age within our lifetime! Instead, this view means that human culture is a vast interconnected system that, when viewed at a large enough scale, goes through very predictable phases. The details may shift one way or another. (The movements of atoms, remember?). But the larger pattern will be the same. We will innovate and grow. We will find ways to expand our political and economic reach. This will lead to greater levels of political and economic interdependence, creating dependent systems that are increasingly tightly wound to one another. As it grows, it creates stress on the entire fabric, until a tipping point is reached and the entire thing collapses under its own weight. Like a Jenga game that has gone on too long: the collapse isn’t the fault of any one brick or any one move. It’s simply that the game had been played for so long that there were no viable moves left. Nice post, Hari Seldon! If you don’t mind, I’ll be putting a copy of your graph on my blog, along with a link and the words “recommended reading”. As a measure of the complexity of civilization, I like the size of cities. I never looked at numbers, but conceptually we’re on the same page I think. You say “If it follows the same pattern as previous cycles” then we’ve only got about 200 years. I say the cycle of civilization is just another economic cycle, like the business cycle. Business cycles have no definite time limit; they last as long as things go well. But your 200-year number is definitely an eye-catcher, and I accept it with something like the same kind of flexibility that Eric H. Cline gives to his 1177 B.C. date. I prefer the thinking of Arnold J Toynbee. (I read the two-volume abridgement.) He says civilizations continue to grow as long as they successfully solve the problems that arise. Great post. And I really like that graph! Thank you very much! And you absolutely have permission to use my graph. No explanation of how you measured the “index of complexity and connectedness”? Is it anything other than “whatever will make this graph look good”? Thank you! You are correct: although I tried to suggest my meaning through the repetition of certain themes and phrases throughout the discussion, I never actually laid out a “definition” of the notions of complexity and connectedness. I appreciate you reminding me to take a moment to clarify this. As I said in the article, the main factors I’m looking at are political and economic. Focusing on these two things omits factors that a lot of people intuitively associated with “cultural complexity” that are correlated with these things — stuff like the amount or scale of art and literature produced by a culture — but often these other factors are more subjective and harder to even imagine how to measure. Does grand architecture count as art? Does the physical size of the monuments matter, on the grounds that creating massive temples and statues requires more cultural coordination and pooling of resources? Do you measure the amount of literature produced by a culture by the number of novels written? What about plays? What about oral traditions? And so on…. it seems best to just leave these out of the equation entirely. 1) How many distinct entities interact on a regular basis? 2) How great of a distance do these interactions span? 3) How frequently do these interactions occur? All three questions can be applied to both the economic world (trade interactions) and the political world (negotiations, defense and alliances). My focus on these three questions isn’t arbitrary, nor it is “cherry-picked” for this discussion. It is rooted in the way “complexity” is understood more generally in the broad interdisciplinary fields of complex dynamic systems research and chaos theory. While nobody has actually devised a universally accepted numerical way of measuring “complexity” in a system (not even for biological or physical systems, much less cultural ones! ), there is a general consensus among researchers that complex systems are those in which coherent subsystems are woven together in networks of constraints and causal forces that lead to massive and often unpredictable interdependencies. Herbert Simon referred to these “complex systems” as “partially decomposable”, because while you can identify components or subsystems, the feedback loops and tight meshes of mutual constraints and relationships give the system as a whole properties that are “emergent” and can’t really be causally isolated as explanable in terms of simple additive or linear relationships between those components. So, that is the framework from which I’m approaching this somewhat nebulous notion of “cultural complexity”, as well: number of interacting parts, frequency of interaction, distance of interactions and dependencies. At the places on the graph where the index is at the “low points”, we see a world (in the geographic regions under discussion, anyway) where distant trade routes have collapsed and economic activity has shrunk to be much more local, where the “span of control” of political entities has shrunk to the level of local towns and villages, rather than there being a unified political “empire” spanning large territories, and where the communication between distant lands has all but disappeared. At the “high points” on the graph, we see very frequent trade — and economic systems that absolutely depend on that frequent trade! — between very different cultures, very different peoples, living across vast distances. There is an infrastructure established for sending goods, communications, and troops when necessary, across great distances, which in turn allowed the political powers centered in particular cities to exert their will and force across greater distances. When there is a tragedy in Greece, it has an effect in what products are or are not available for consumption in Babylonia.